Compassion is the wish that others be free of suffering. “Seva” the concept of selfless service and volunteer work is a way to broaden our capacity for compassion, broaden the connection to our human family, enrich our sense of meaning and enkindle joy. Seva can be big or small. 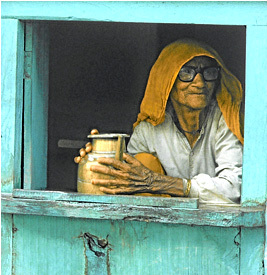 I am always touched to see the water-givers while I travel through the heat and dust of India. Their presence in a thatched hut or by a window to give water to a parched passer-by is moving. There are many ways to serve and give repeatedly during our daily life and there are many groups that help us extend our reach. Seva Foundation is an organization with such a mission. I recommend looking at their website to consider connecting in some way. Inspired by the founding efforts of Larry and Girija Brilliant, (Larry was former director of Google‘s philanthropic arm) and with early donors like Steve Jobs, this foundation has a beautiful heart with clarity of vision and a noble reach. I am glad to see one of Seva’s efforts, with partners, is to reduce preventable blindness in poor communities with cataract surgery.I often saw advanced eye conditions in villages I worked in and wished that treatments had been more available. I will continue to add organizations that are committed to serving others as this website evolves.